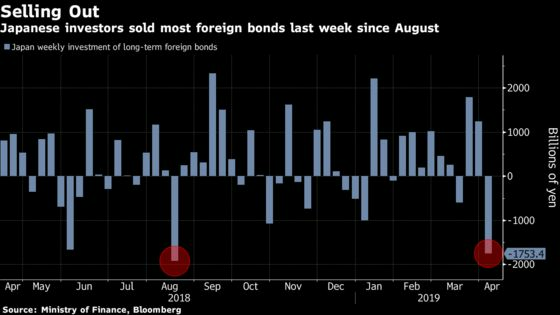 (Bloomberg) -- Japanese investors offloaded the most overseas bonds since August last week, seeking to take advantage of the dollar’s recent strength against the yen to lock in profits. Funds in the Asian nation sold a net 1.75 trillion yen ($15.8 billion) of foreign debt in the week ended April 5, the most since August, according to the Ministry of Finance. They has been net buyers in eight of the nine previous weeks. The dollar-yen exchange rate climbed to a three-week high of 111.82 on April 5. The Treasury 10-year yield slid 31 basis points last month as bonds rallied around the world on speculation central banks would ease monetary policy to support growth. Japan’s 10-year yield slipped eight basis points in March. Japanese funds have been net sellers of overseas debt during the first week of April in every year starting in 2011, MOF data show. “It’s becoming a trend as investors may want to start the new year by securing profits in their foreign bond portfolio,” NLI Research Institute’s Ueno said.